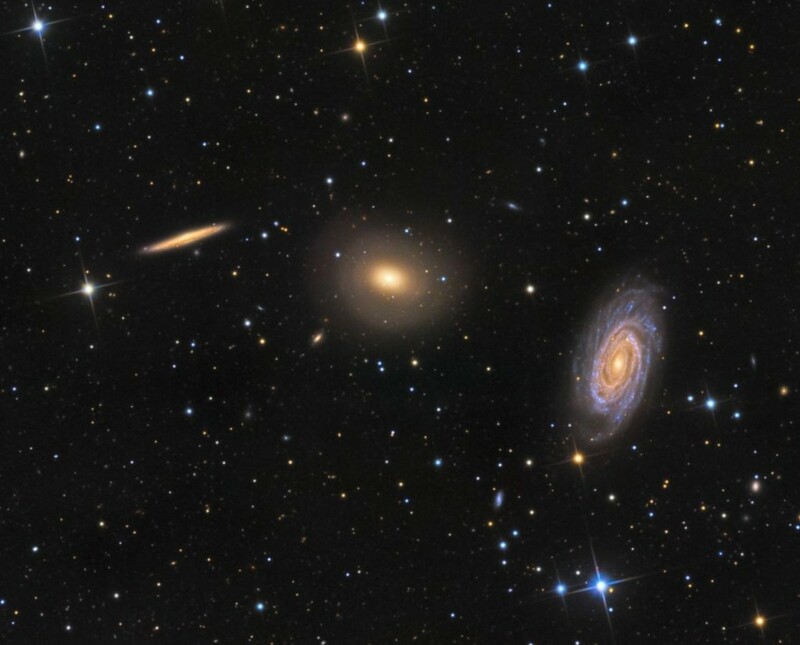 Here are three beautiful galaxies in the Draco constellation. These three galaxies are (from left to right) NGC 5981, NGC 5982, and NGC 5985, which lie 100 million light years from Earth. The sharp-edged shell details on NGC 5982 hint at a previous galaxy merger. To many deep sky observers this is also known as the “Draco Trio.” Seeing two barred spiral galaxies at different angles is a rare sight to see in one image. There are a few mysteries bubbling in some of these galaxies. For example, NGC 5982 has been said by researcher SimÃµes Lopes, that the galaxy may house a supermassive black hole within its active galactic nucleus. Not only that but there may even be a quasar near by from the way the galaxies are distributed across the sky. There are always mysteries in the universe and even when we have images there is still much to learn. If nothing else, it always astounds me that we can cram unfathomable galaxies in a picture. Universe Today did a wonderful write up on these galaxies and you should head on over there now and check it out! Until then, keep looking up!